Don't you just love to hear your kids laugh? Are you looking for some new games? Here are some great ideas for the newest and best funny games for kids. Humor is a great way to learn and bond. And playing games is wonderful for developing interaction skills both with peers and adults. If something is fun and can make them laugh, your kids will want to play games often. 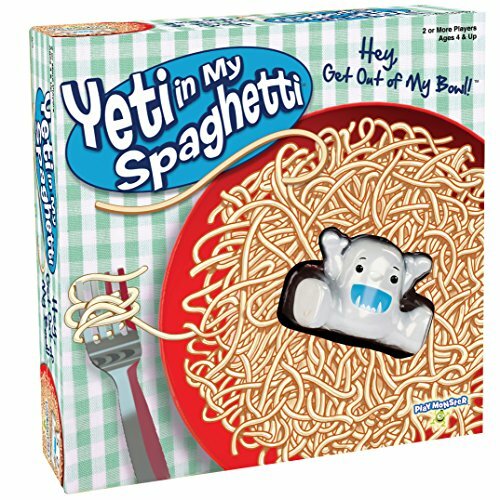 Yeti in My Spaghetti is a game that will have your youngsters roaring. Its advised for 2 or more players and is best played by kids 4 and over. This game is just for fun! The game comes with a red bowl. Fill it up with the plastic noodles and lay the cute little yeti on top. Each player takes turns pulling a piece of spaghetti out of the bowl. Whoever pulls the noodle that lets the yeti fall to the bottom of the bowl loses. This is a game that only takes a few minutes to play, so is great for kids with a short attention span. It is fun for older kids and adults to play too. This game can help to build motor skills. Although this is a game that is advertised for multiple players, it can be used as a one player game too. Your child can try to see how few noodles he or she can leave in the bowl before that silly yeti falls. Add a little "flavor" to games night with this simple game that will appeal to the whole family. A magical combination that is sure to make everyone laugh in a game is farm animals and gastric expulsion sounds [aka "toots"]. 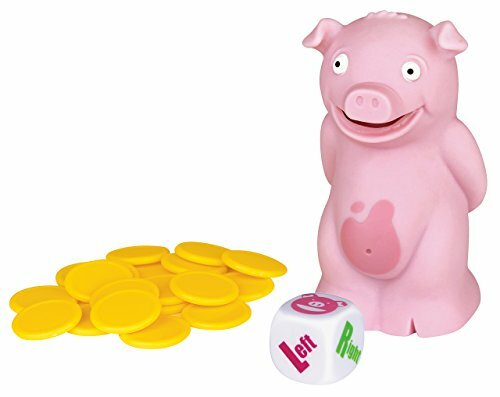 So the Stinky Pig game is sure to have your kiddies rolling on the floor. This uproariously funny game has one object. Dont be holding the bashful looking little pink pig when he "toots"! And he even includes batteries. The pig will play a catchy little tune. Press his tummy and toll the dice. Follow the instructions on the dice to pass left or right. If you get a pig face, roll again. Then pass that pig as fast as you can. Don't hog him! If you are holding him when he toots, you take a token. Play continues until all the tokens are used. The person who has the least tokens wins. This game is suggested for kids that are 6 years old and up, but it is truly something the whole family can have a good time playing. You can have a gas playing this game and your kids will go hog wild! All puns ARE intended, and made with the best of humor. 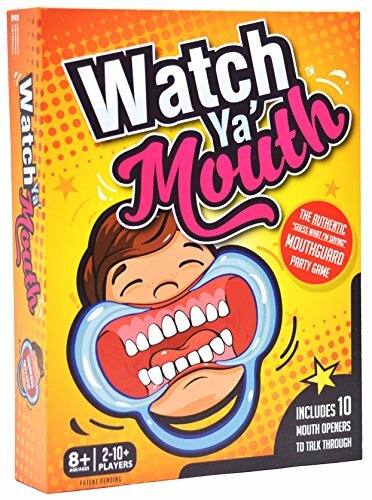 Watch Ya Mouth is a hilarious game that is rated for ages 8 and over. You can play it with 2 to 10 players. It will have the whole family ROFL! It is one of the best selling new funny games for the whole family. This game involves speaking fun and funny phrases while wearing a mouth guard. The mouthguard, of course, hampers the speakers speech. Can the rest of the players figure out what you are saying? Included with this top rated cool, funny game are 10 mouth guards that are FDA and CE safety tested. There are 6 medium sized pieces that are the right size for teenagers or adults and four small sized guards that are perfect for children. They are easy to clean and disinfect. The mouth guards are easy to clean and disinfect. Click here to get new small replacement cheek retractors when they wear out or get damaged by use. Also included are durable laminated cards containing the hilarious phrases, and instructions on how to play. Click here for expansion packs of cards for kids and some for just adults too. There is even a bible phrase version! 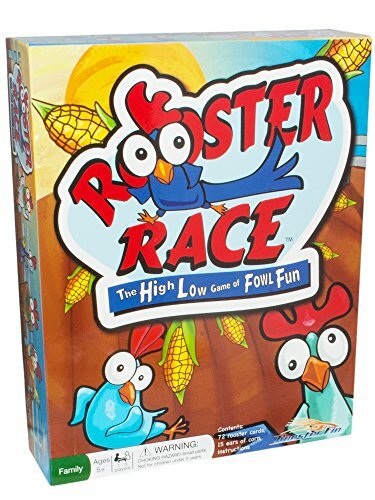 The Rooster Race is one of those awesome funny games rated for kids aged 5 years and older. 1 to 5 children can play this game. It is bound to get lots of giggles from the younger crowd as they try to become the rooster with the most corn! One rooster card is turned up in the middle of the table. Children each get 14 cards that are dealt face down. The contestants try to predict if their top card is going to be higher or lower than the main card. If they are right, they get a corn. But WAIT! If they are wrong, they have to put their corn back. Their card then becomes the top card and the next player has to guess if their top card will be higher or lower than that one. The game continues until all the corn is picked. The kid with the most corn wins! This game contains 75 rooster cards, 15 yellow corn cobs and instructions. This corny game will teach kids to identify numbers, and which ones are higher and lower. It will provide hours of entertainment for your children. Dont be chicken! Get it today! When it comes to super funny games, you cant go wrong with a round of the Googly Eyes Game. It is a gut busting, hilarious drawing game. 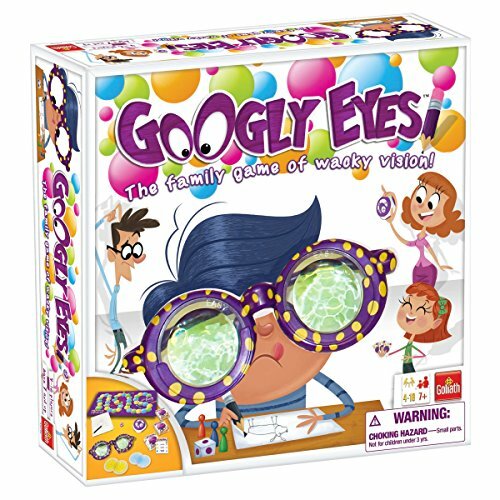 The interactive guessing game comes with a pair of vision distorting goggles with 3 sets of lenses, a game board, dice marking pegs and cool cards to tell you what to draw. Yes, there is a time limit, so a timer is provided. Pencil and paper are included too. There are enclosed instructions for how to play the game. This cool game is rated for 7 years old and older, and is made to play with teams of at least 4, although 2 kids can play it against each other. 3 can even play if the smallest wants to play on both sides for fun. Roll the dice and move your man to the appropriate square. Here you will learn which distortion lens you need to put in the goggles. You then take a card from the top of the pile and put the glasses on and draw what the card says.. There is a time limit. Here is hoping that your team can guess what you have drawn with your kooky glasses on. Be prepared for chuckles and roars of laughter as you draw and guess. Can your team make it to the finish line first? 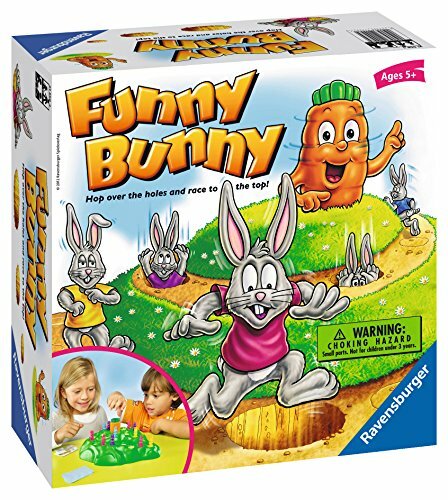 If you are thinking of fun and funny games for smaller kids, look no farther than the Funny Bunny Game by the famous puzzle making company Ravensbuger. It is rated for ages 5 and above, but children as young as 3-5 can easily grasp the rules and play too. Each child starts out with 4 bunnies of the same color. The object is to hop up the 3D game board, paving stone by paving stone to to make it to the carrot at the top of the hill. On their turn, each little one draws a card from the pile. There are two types of cards, bunny cards and carrot cards. If the player gets a bunny card, they move as many spaces as indicated on the card to progress up the path. BUT, if they draw a carrot card, they have to spin the carrot. This makes holes open up on the path. If your rabbit falls through the hole, you have to start over at the beginning. You can play one or a few, or all of your bunnies at one time. There will be hoots of laughter, and some exclamations of despair as your kids play this game. It is uber cute, and will be a favorite. This game will teach counting skills and simple strategies. The board and pieces are sturdy and this game is very highly rated. It is well worth owning.. 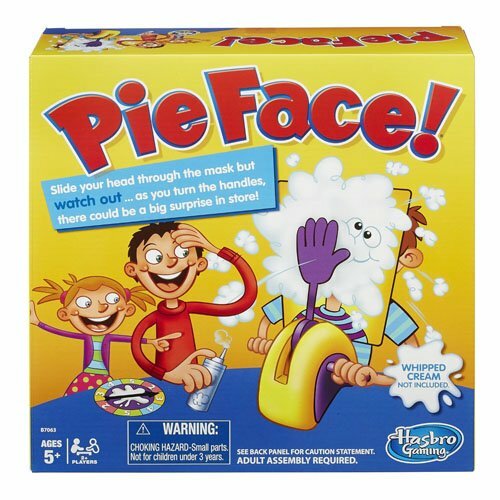 Kids who like to play funny games LOVE the Pie Face Game by famous game make Hasbro. Just a word of warning for parents. Have your kids play this in an easy clean up area. Things can get messy. Outside is a great place on an easy wipe picnic table. This is one of the highest rated, most funny games that you could ever think of. Belly laughs and squeals will be the on the menu for the day. Pie Face is one of those games that is not educational. It is just hilarious. If you have a child that doesn't like messes, they may not want to play, but they will for sure want to watch. All others children will be enamored. The object of this is simple. You set up the arm and hand with either whipped cream (not included) or a wet sponge (sponge included). Spin the card, put your face through the mask and click however many clicks the spinner indicates. You may, or may not trigger the plastic hand to cream your face. Score a point each time you don't trigger the arm. This game is recommended for kids over 5, but even the young ones will have a blast with this one. The set includes sponge, spinner, throwing arm, the pie thrower hand, 2 handles, a chin rest and a splash guard mask. You must supply your own sense of humor! To set up the game, each player gets a diffuse card and then 4 regular cards, for a total of 5 cards. You then insert 1 less exploding kitten card than players. So if you have 4 players, you would insert 3 exploding kitten cards into the deck. Shuffle well. Here is a short video by one of the creators to show you how to play the game. The artwork on these cards is hilarious! Once your child/children understand the rules, this game will become one of their favorites. It is a fun game for the adults too, so its perfect for family game nights. 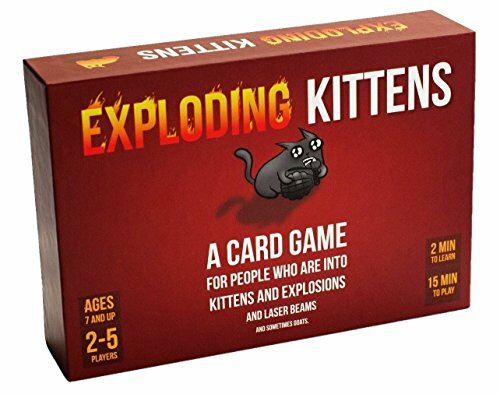 Click here for the Imploding Kittens expansion pack that gives you enough cards for 6 players instead of 5. It includes new action cards too! 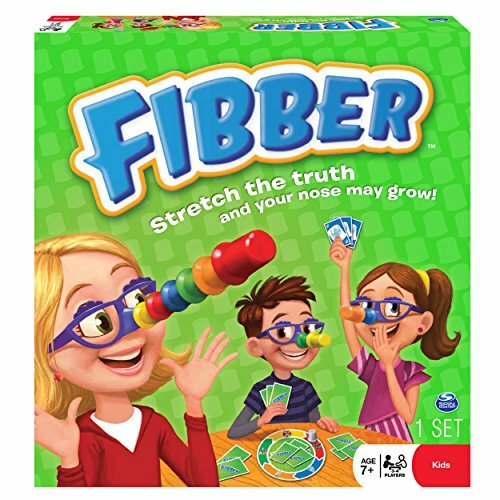 When my grandkids talk about fun funny games, Fibber always comes up. It is a funny, silly game that allows you to "fib", but look out if you get caught!! It is rated for kids 7 and over, but they played it when they were 5 too. It can be played by 3-4 players. Each player gets a pair of glasses with a nose. All cards are dealt out to the players. The game board has various characters on them. You start with the Sasquatch and use the silver nose as a marker. You lay cards face down and say however many Sasquatch cards you are laying. You can choose to be truthful, or fib. Anyone else playing can call fibber. If you are fibbing, you get a nose piece and have to pick up all the cards in the center. If you are not fibbing, the one who calls fibber gets to pick up the cards in the discard pile. If no one calles "fibber", the play goes clockwise to the next square and the next player. The player with the shortest nose wins the game when all the nose pieces are gone. Kids just love making their nose grow like Pinnochio when they get caught fibbing. Are you looking for kids funny games for your 3 year old? Educational Insights has developed a board game that is funny and helps your three year old learn. 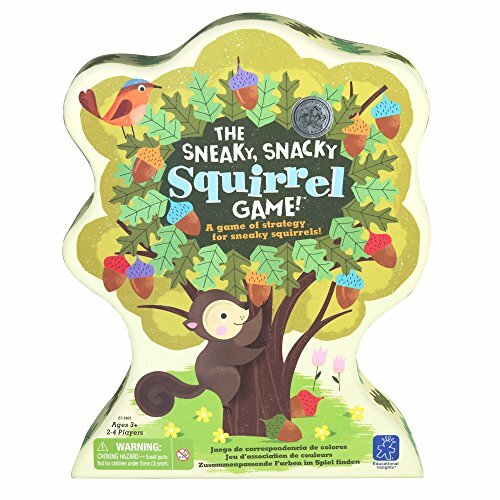 The Sneaky, Snacky Squirrel Game is so funny! Sneaky, Snacky Squirrel comes with the board (which is the inside of the box lid), a spinner, a squirrel squeezer, 20 colored acorns and 4 logs to put your acorns in. The object is to get your acorns in your log. This is accomplished by spinning the spinner and following the instructions. They then take the squeezer tweezers and pick up the acorn that the spinner tells them to, and then they add it to their log. But then things get tricky! There are steal an acorn, or lose an acorn possibilities too to add excitement and variety to the game. This game has won many awards, including Good Housekeeping Toys Award. There will be lots of giggles as your little squirrel learns how to pick up the acorns with the squirrel shaped squeezers. This cute little game for kids teaches them about colors, taking turns, and operation of the child size tweezers teaches fine motor skills. Another extremely funny game is "You Gotta Be Kidding". It is a kids board game based on the popular "Would You Rather" games. This game is rated for ages 7 and up. 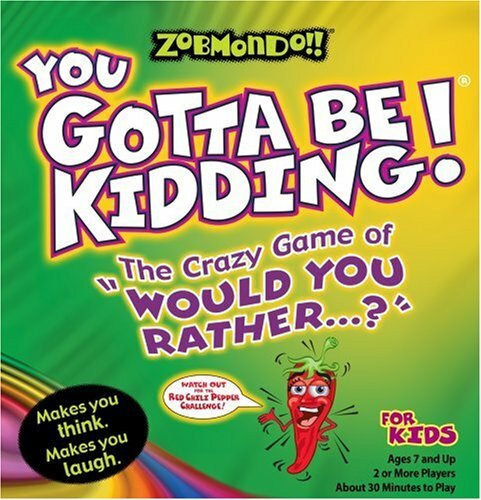 Included in this game there is: a game board, 4 tokens, a toy chili pepper, 400 "would you rather" questions, 15 challenge cards, a timer, a dice. pen and paper, and marker tokens. As you shake the dice and move your man up towards the finish line, you will land on play squares that will give you one of two plays. Either you will get a "would you rather" square or a "Challenge" square. The Would You Rather cards give you a choice of 2 things. You pick the one that you would rather do and a reason why. Try to figure out your friends choice. Warning! The reasons can cause giggle fits. The Challenge cards give you things to do in order to move up the board. These include drawing, finding things and doing zany things. This part will cause gut busting laughter. Of course, these tasks are timed. If you get the red chili pepper card, you play "hot potato" with the chili pepper until the chili screams at you. This funny childrens game takes about 30 minutes to play. This board game will teach your kids improvisation skills and develop their imagination. They have to make choices, which helps them to develop decision making. So to use a spin off on a game card, would you rather listen to your youngster giggle or eat a can of cat food? 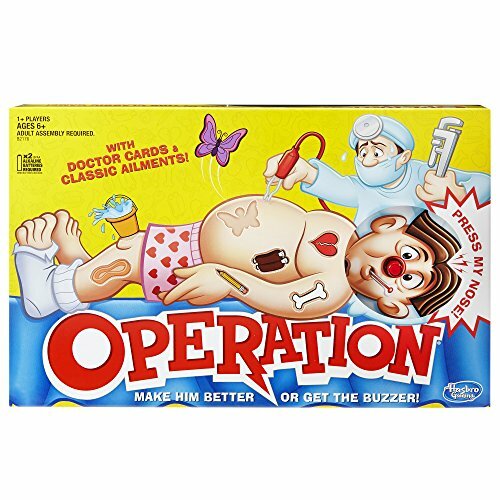 One of the original funny, funny games for kids is Operation. The game is recommended for ages 6 and up, but younger kids love to try it too, and they get a real kick out of it. Batteries (2 AAs)are included in this classic game of Operation. Also enclosed in the box are instructions, doctor cards with points assigned, tweezers, the patient (Cavity Sam), and 12 removable "parts", or ailments. Players choose a doctor card and try to use the tweezers to remove the depicted part off the patient without causing the patient to buzz, vibrate and his nose to light up. The parts all have tongue in cheek names, such as wish bone, and Adams apple. Who will be the steadiest doctor? This game can be played alone or with others. I am a grandma, and I can remember playing this game as a kid. This game is guaranteed to tickle your little ones funny bone. The game of Operation now comes in many different themes. Click here for more Operation themes to choose from. There is a choice for every child. Another one of the cool funny games that comes to my mind is Twister. Its another oldie but goodie game that will have the whole family guffawing. 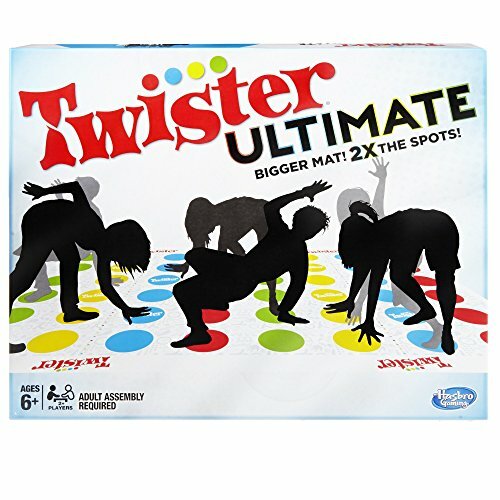 The Twister Ultimate Game is created for children aged 6 and over, but the whole family will want to get in on the action, regardless of age. The object is to be the last player "standing" on the 5.3 foot by 7.75 foot mat. This is one convoluted game! The designated "spinner" spins the included spinner. Then all other players just follow instructions on what colored spot to place your feet or hands. And yes, it does tell you whether to use right or left appendages. There are also other instructions, such as "raise your right hand". There is also a spinners choice challenge. But don't fall, or you are out! It is hilarious to see the contortions that end up happening. It is advised to play this game in bare feet, as socks may be too slippery. This is a great stretching game. Flexibility is optional, but it sure helps. This interactive game from Hasbro is larger than the original twister game and has twice the amount of colored landing spots. The best game ever to laugh and excersise at the same time! Here is a game that will make your kids giggle even before they play it. Poopy Head is a fast paced card game for kids aged 6 and up. 2 or more players can get in on the action. What kid doesn't like funny games about bodily functions like #2. There is a deck of cards, 5 poop swirl headbands and a whoopie cushion. All the cards are dealt out between the players. There are different colors and 3 images, a toilet, a poop, a toilet paper, and wash your hands cards. To play the game, the cards must be laid down in the correct order, toilet, then poop, then toilet paper and then wash your hands. But wait! You cant use the same color twice in a row. There is no "turns" in this game. Lay the cards as fast as you can, while shouting out what it is. When one person doesnt have the "next" card, he or she slaps the whoopie cushion and the round is over. The game ends when all the poops are distributed, and whoever has the most poo on their head loses. This game will provide lots of fast paced action and laughs. 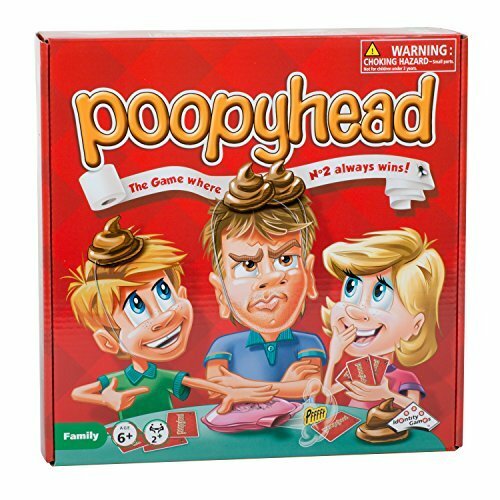 Kids love it and there will be shrieks of delight as the figure out who is the poopyhead of the game. Another super funny game for kids that makes fun of one of our least appealing functions is "Who Tooted". Lets face it, farts can be funny, especially to kids. This game is silly and will have them laughing so hard their faces will hurt. 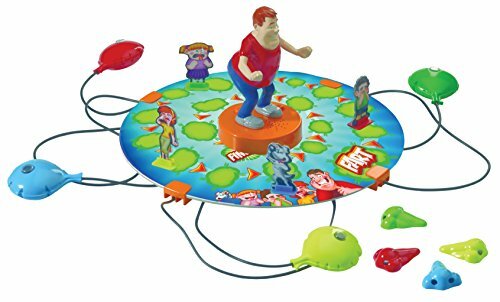 The game consists of a game board, 4 family member game tokens who are portraying hilarious expressions of disgust, a large "dad" which contains the master brain of the game. It takes 2AAA batteries which are not included. There are also buzzers with mini whoopie cushions attached. Each colorful cushion has a light. There are also 4 noses to sniff out the noisy culprit. The game is played by pressing the button on the game controller "dad". One of the whoopie cushions lights up and that player pushes his cushion. The other players try to guess who pushed the button by pointing the nose at the suspect. The perpetrator points a nose too! The ones who are correct move forward on the game board. Kids of all ages get so many chuckles from this game. It is sure to become one of their favorites. Its a great party game too. 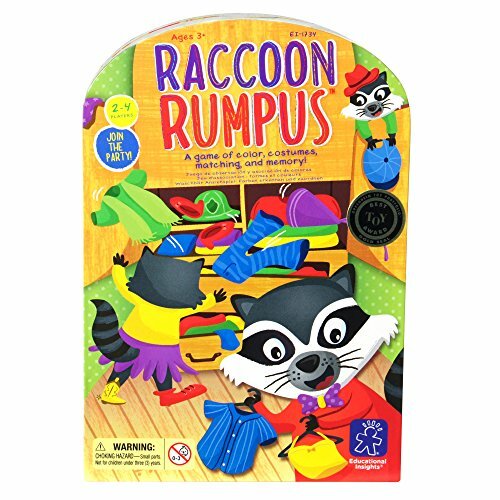 Also on the list for childrens funny games is Racoon Rumpus. Its a cute and chuckle earning game for young ones aged 3 and up. Watch the eyes light up when you bring this game out to play. It can be enjoyed by 2-4 players. This adorable game can help your toddler or pre-schooler learn colors, matching skills, memory development, motor skills and of course, interaction skills while playing. They learn to take turns and have fun at the same time. The object of the game is to be the first to dress your raccoon card in 5 different outfits. The game comes with 4 raccoon cards with raised faces, 40 cute and zany colorful costume cards and 2 dice. One is a costume dice and the other is a color dice. The first player rolls the dice and picks up the matching colored costume and dresses his or her raccoon in it. Beware of rolling the underwear dice! Then your raccoon loses ALL his clothes. The embarrassment of it all :). Kids think this is hilarious! But if you roll a rainbow card, you can pick any costume for your raccoons wardrobe. You can also play a memory match game by turning over all the costume cards and mixing them, then matching them. This game will captivate your whole family. Thank you for visiting Funny Games for Kids. Humor is one of the best teaching skills. It is also wonderful for family bonding. No matter what your childs age, games are fun. This selection will give you a broad choice of game types for all ages. Family game nights just got even better!